One of the most frequently asked questions patients suffering from hair loss have is about the healing after the Hair Restoration. Wrongly, many of them believe that Hair Transplant is a procedure that includes scalpels, reception incisions or stitches. Truth is that DHI’s Direct In technique is the most simple and safe Hair Transplant procedure worldwide that unlike with other hair transplant methods – such as FUE and FUT (Strip)- does not include scalpels, reception incisions or stitches. Moreover, in most of the cases, patients can return to work the next day after the session! 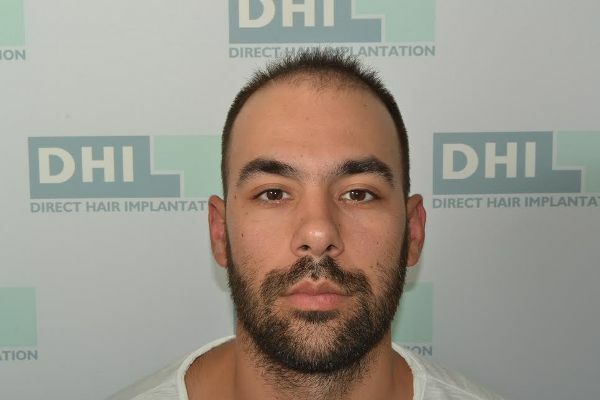 Konstantinos Tsagkanis, the winner of the free DHI Hair Transplant, had his session 70 days ago and today he is looking great like he never had any kind of hair treatment. “No one notices that I had a hair transplant. During the summer I was a bit careful with the sun but nothing special. I even went to the beach and had a swim, like I did before the session. I am using Minoxidil twice a day, every morning and night, and I am waiting to see my new hairs”. Kontsantinos Tsagkanis had his Hair Transplant done on Friday 17 and Saturday 18 of June. The Giga session was performed at the DHI clinic in Athens and during the two days the medical team managed to transplant a total of 6.198 hairs (2.903 Grafts). Click HERE and see Konstantinos 20 days after the session.